The reason, I think, is that it was not clear a) if the entire process actually happened, and b) what all I was actually submitting. So, I decided to take a bit of time and add some redesign to make things a little less confusing. I’ve also blurred out the company name for politeness’ sake. What did it look like at first? 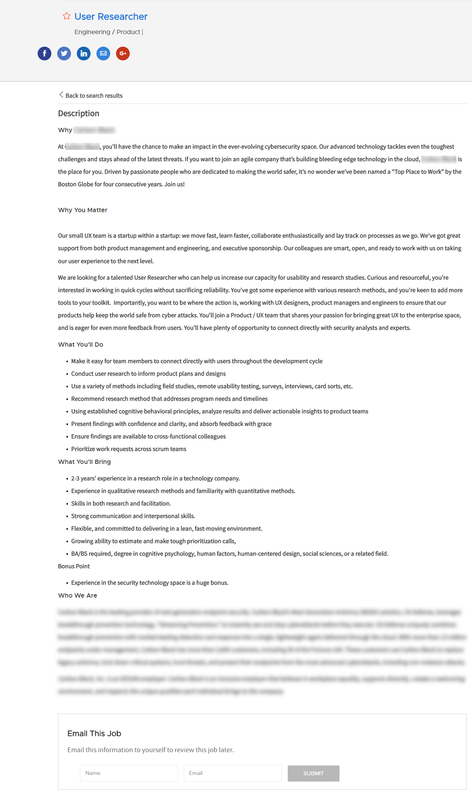 When you look at a job description, you get something like this (with a bright orange ‘apply now’ button that is not visible in this screenshot). This seems fine. 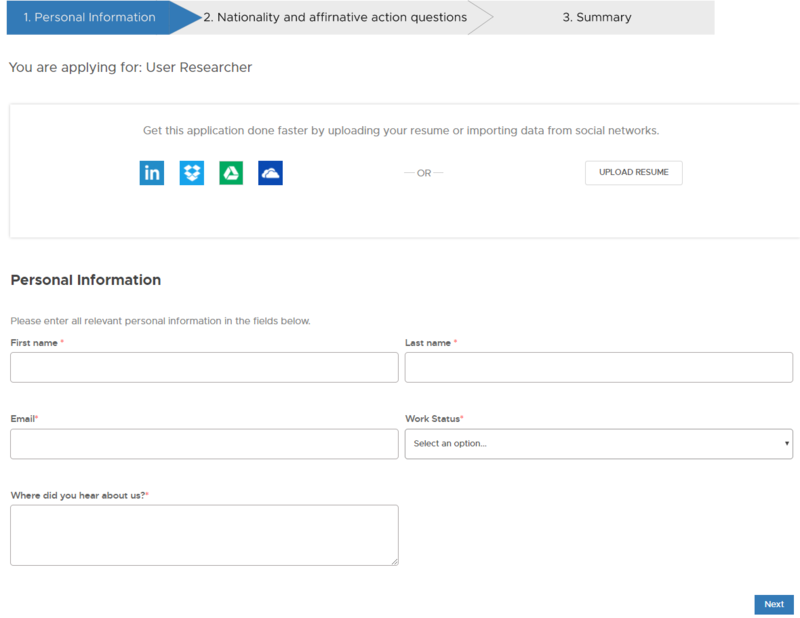 After you click Apply Now, you get an odd sort of thing about your personal data collection. I’m guessing this is because it’s a security company, but it reads all sorts of weird. Whatever, that’s not a huge deal. Next, you get your first page of the application. I like that they remind you what you’re applying for! Wait. What? We just jumped to questions about my nationality and my affirmative action status? What about my work experience? My education? A cover letter? 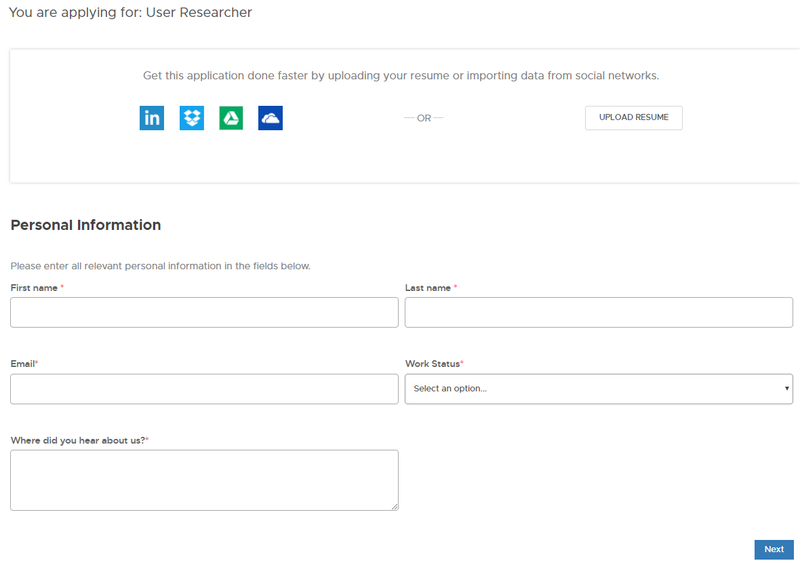 Did the resume upload skip the need for work and education info? Maybe, let’s keep going. You might notice (I didn’t at the time) that this button says ‘Submit’, not ‘Next’. I didn’t grab a screenshot (and didn’t want to apply twice), but that’s the end of the application process. It thanks you, and it sends you email confirming your application. What? I don’t even know for sure what it sent! I don’t know how well it parsed my resume. I have no clue at this point what just happened. Ok, so that was all sorts of confusing. Enough so that last night as I was falling asleep, I was distracted by wondering what would help. I considered a progress indicator, as that would at least make the extreme brevity of the application not a surprise. I also wondered if they’d labeled the final button ‘Submit’, which they actually had. (but perhaps ‘Submit Application’ would have been a clearer signal!) Finally, right before I fell asleep, I realized that what I most missed was a summary of what I was about to submit. Look! It’s the first step of three! My version of the second page (which was the last in the previous version) also has a progress bar, and changed the button to say ‘Next’. Not sure why I couldn’t make the carets a little more visible when they are between things. And perhaps I need some sort of ‘completed’ indicator for the first step, like a checkmark. Still a weird jump, but at least I had a chance to expect it. Finally, I made the very barest of bones summary page (the progress bar, what one was applying for, and a brief statement about the summary page). 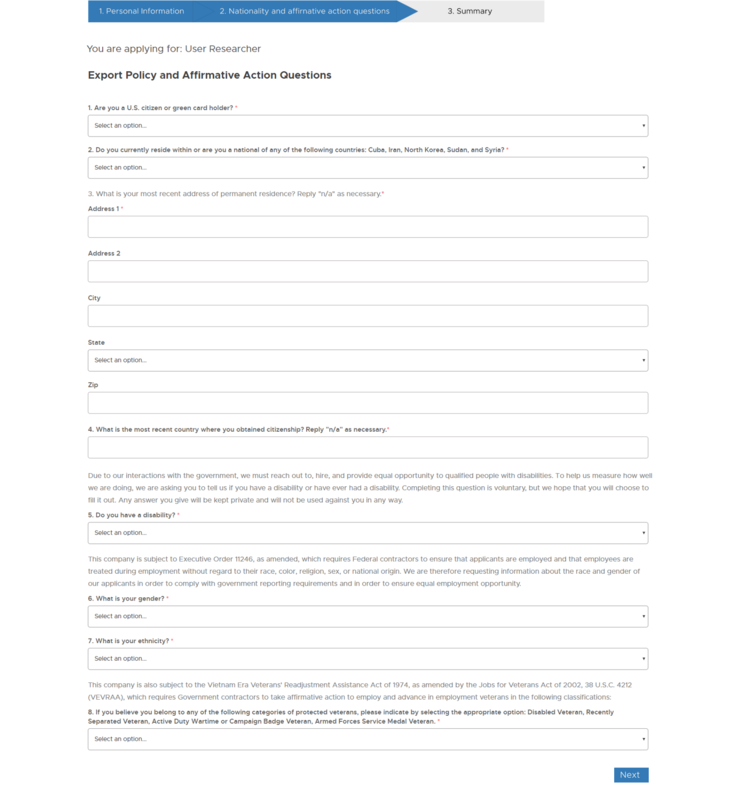 I didn’t make the whole page, which means that I didn’t get to include a “Submit Application” button instead of just ‘Submit” or suggest ways to make it easy for people to change things they don’t agree with. The latter seems important, especially if it really is automatically interpreting the resume; perhaps offer inline editing? Not entirely sure how to end progress bars of this type, but you get the point. 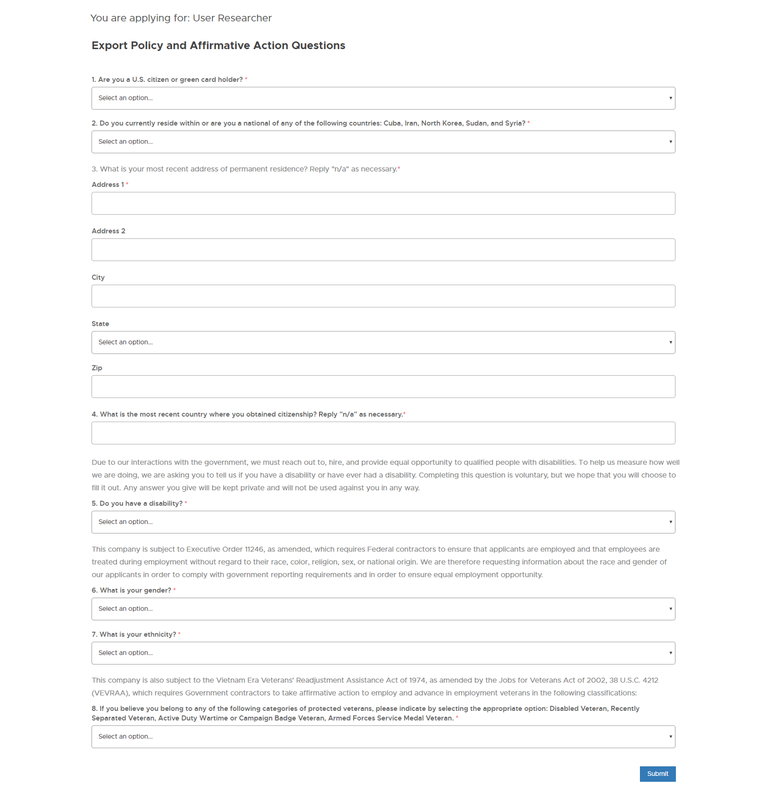 I’m struggling with the visual design part of things, but at least I feel a little better about the weird application process, having “fixed” it (at least in theory). I’m not sure what happens if you don’t submit a resume in that first page (or if you use linkedin or something instead). It seems like it might be a kindness for them to tell you what submitting your resume (or associating with social media) did for you, so that it’s less confusing when it never asks about jobs or education. Also, Gravit Designer is a pretty nice tool for this purpose!